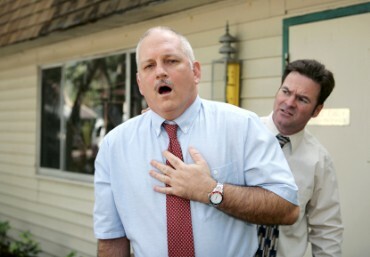 A heart attack is a serious and painful interruption of the heart's normal beating. Heart attacks are due to a blockage in the coronary artery. People who are having a heart attack put their hands over their chest. A pickpocket is a thief who steals from people's pockets, purses, and bags in public places. Many cars are stolen each year. 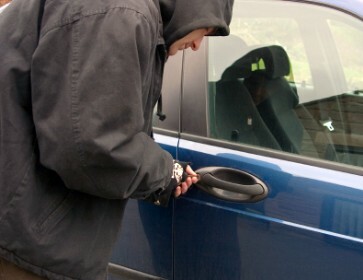 The car thief in this picture is using a tool to open the car door. Copyrights to the pictures and photos on this ESL and EL Civics website belong to individual photographers. We have purchased the rights to use them. Do not copy the pictures and photos on this educational website. Permission is granted to download any of the free ESL worksheets for classroom or home study. Permission is granted to link to any page of this educational website. Contact Christina Niven, ESL teacher, at christina@elcivics.com. Please send corrections, comments, and requests for new lessons. Copyright © Christina Niven, 2007.